I would like to thank everyone that took the time to complete the Grow Kingston survey. We received 115 responses back which represents a 47% participation based on number of surveys sent out. We received responses from all areas of the community, so based on the large response we got and who responded the information gathered will be a good reflection of the entire community’s needs. We are currently analyzing all the information collected and once we have this complete we will make this information available to the community, either through meetings or on our website. As a follow up to the talk by Zaki Djemel about Jerusalem Double the Backgammon league for Jews & Arabs in Jerusalem, if anyone is interested in playing or learning how to play backgammon please send me an email at president@jewishkingston.org as I would like to start a similar backgammon league in Kingston. At The June 2017 AGM The Kingston Jewish Council agreed to support the Shoe Box Project which is aimed at helping First Nation children in Northern Ontario reserves achieve a better life and education. This Year’s Shoe Box Drive will be targeting the following 3 communities: Kashechewan, Fort Albany & Moose Cree from Moose Factory. The fall drive has started and will end on November 30th. 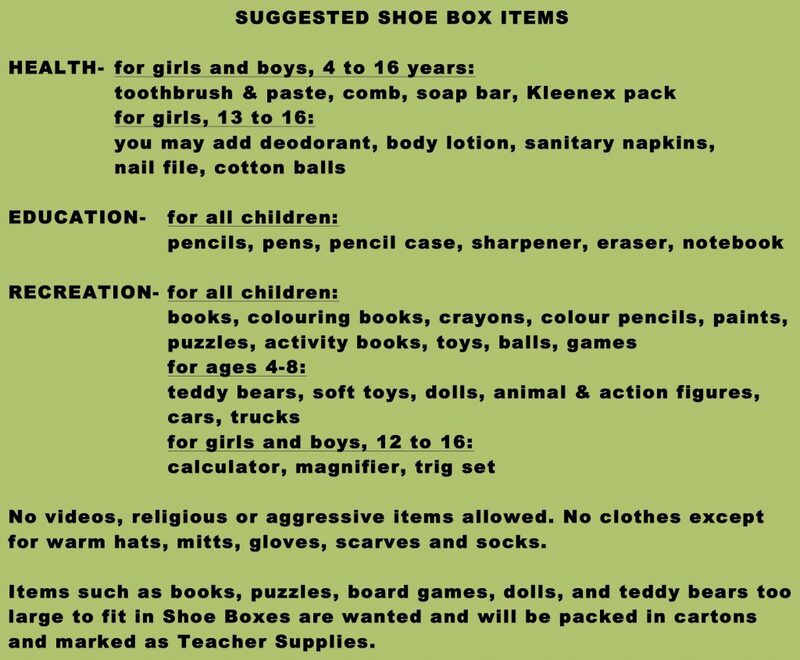 Shoeboxes will be stored and assembled at Beth Israel and will all be labelled “From the Kingston Jewish Community”. Items or boxes can be picked up or dropped off to Ruth Dukas 85 Ontario Street Apt 408 entry code 1493. Call or email Ruth at 613-549-2298 rkdukas@cogeco.ca to arrange a suitable time. Cash donations are also accepted (make cheques out to I love first People). Any cash donations over $20.00 will receive a tax receipt from I love First People Charitable number 84091704RR001(in Feb 2018). I encourage all members of the Jewish Community to participate in the campaign and show these children that we care about them. A poster about this campaign is included which outlines what to put in a shoebox or you can go to the website www.ilovefirstpeoples.ca for more information. December 13 at 5:30pm – Light Up the Night, KJC’s 11th annual Hanukkah celebration taking place in the Springer Market Square Amphitheatre. All are welcome so spread the word! In November, there will be a city-wide campaign to fill Shoe Boxes for Indigenous Children of Northern Ontario. KJC, along with other ethnic, religious and community groups, has been asked to support and contribute to the needs of these isolated and troubled children. KJC has adopted this project wholeheartedly. You can help by filling a Shoe Box yourself or contributing items which a volunteer group will put together in the Shoe Boxes. The summer is a good time to start collecting items for the Shoe Boxes; the Sunday Market, garage sales and dollar stores are excellent sources of supplies. Items must be clean and new. The Shoe Boxes go directly to schools for children 4 to 16 years of age and is confined to 3 categories: Health, Educational and Recreational items. No videos or clothes are accepted except warm hats, mitts, gloves, scarves and socks. A suggested list of items is included below. Each Shoe Box displays a label from the donor and an encouraging short message may be included. Each Shoe Box will have a label “From the Kingston Jewish Community” attached to it. The airlines are flying the Shoe Boxes into the North without payment but the volunteers that accompany and distribute the Shoe Boxes must pay for their fares, so a very small contribution in each Shoe Box is appreciated to help pay for their flight. Donations in lieu of Shoe Boxes will receive tax receipts, as this is a registered charity. We have already started collecting items and will be happy to arrange pick-ups. If you are interested in helping you are welcome to join us. Assembling the Shoe Boxes is being done out of my apartment at 85 Ontario St., Apt. 408, until a Collection Depot is opened November 1. My name is Ruth Dukas, please feel free to ask for any information you require at 613-549-2298 or at rkdukas@cogeco.ca. Please help us make this project of KJC a great success and provide proof to Kingston how much we care for the welfare of our youth in Canada. KJC is proud to offer Israeli dancing lessons on Monday evenings from 7:00-8:00pm at Beth Israel (116 Centre St.) All ages and abilities are welcome to join these fun, relaxing lessons, taught by Jackie Mills. Jackie has over 30 years of experience teaching Israeli and International Folk Dance, with a focus on classic and children’s Israeli dance. Please email jrm@sitndance.ca to confirm class dates. Students from Iyr Ha’Melech and Beth Israel came together on September 17 to make pickles. These pickles are now ready for sale – $7 per jar, available by contacting Leanne Lieberman at leahdevorah@hotmail.com or Lisa Cassidy at lisa@wassyng.com. Please support the children in their Tzedakah project. Sunday, November 12th at 12:00 noon at Beth Israel Synagogue. Elyse Goldstein is the visionary rabbi of Toronto’s City Shul. She is the first woman to be elected as president of the interdenominational Toronto Board of Rabbis and president of the Reform Rabbis of Greater Toronto.